Tall annual herb that can grow up to 2m in height. The leaves are green with golden brown veins, the stalks are golden brown and it produces large orange-golden seed heads maturing in 120 days - can yield up to 450g per plant. 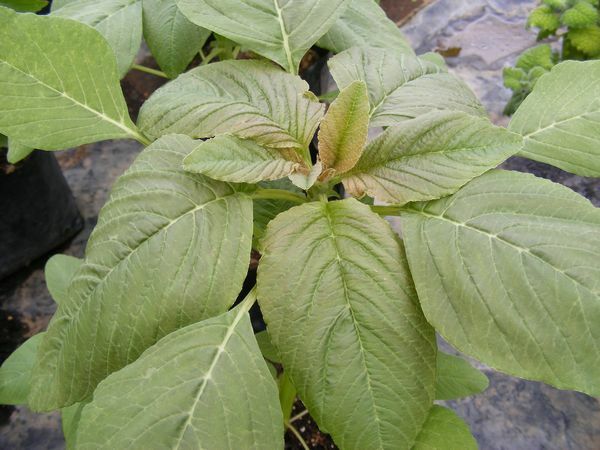 Prefers well-drained fertile soil in sun and can tolerate a pH 4 to 7.5. The leaves are eaten as a vegetable. Young leaves can be added to salads and mature leaves are cooked like spinach. The tiny seeds can be sprouted and used in salads or popped like popcorn. Can also be combined with wheat/other flours for baking cakes/bread or cooked into a porridge. Important crop in rural areas in Africa. Pick leaves throughout the season and harvest the seeds when ripe. The whole plant is astringent, controls bleeding, has soothing properties and is used medicinally. The leaves are rich in vitamins and minerals and the seeds are a good source of protein. Use internally for diarrhea and excessive menstruation. Yellow and green dye can be obtained from the whole plant.